Rinse the quinoa in a fine-mesh wire strainer under running water for 1 minute. Bring the water or broth and quinoa to a boil in a 2-3 quart saucepan. Lower the heat, cover, and simmer for 15 minutes. Refrigerate until cool. Meanwhile, combine all the vegetables in a salad bowl. In a small bowl, mix together the dressing ingredients. Add to the vegetables. Add quinoa and stir gently to combine. 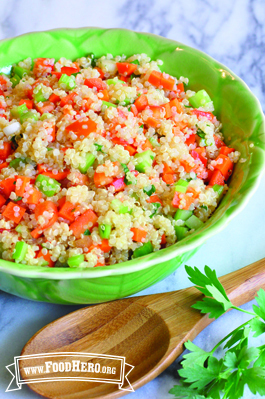 6 Comments for "Quinoa Salad"
This salad is so colorful and tasty! It is easy to make ahead and pack for lunch during the week. I cooked the quinoa in low sodium vegetable broth which added a lot of flavor. I also had fresh cilantro on hand so I used that instead of parsley. I really like the tart flavor of this salad, but if you aren't a fan of vinegar start with half the amount and add more to taste. This is a wonderful recipe!! My family loves it as do guests...we make it often! And it makes great leftovers. This is a great recipe IF you cut the amount of vinegar in half! I made it just like the recipe calls for, and it was waaaaay to liquidy & tart. I used half the amount the next time and it was perfect! This is a great recipe if you are already a quinoa fan. We sampled this at a food bank and it wasn't their favorite. Many of the folks at one of our sites have a lot of dental issues so the really firm fresh carrots, celery, and peppers were a source of complaint. You can partially steam them ahead of time to make them softer. I make a similar salad at home and add fresh mango and black beans to the recipe and it is a family favorite. This is one of my favorite recipes on this site. It is oh so good and healthy! I really liked this salad.